Which Fruits Grow on Vines? Planting grapevines on your property can be a wise investment, especially if you enjoy grape products such as jellies, liqueurs and wine. Find out how easy it is to enjoy grapevines on your property with a minimal investment in time and money. One of the most important things you can do when making the decision to plant grapevines is to be aware of your hardiness zone. Selecting vines that aren't hardy in your particular zone will most likely end in disaster. To find your growing zone, visit the USDA Hardiness Zone Map and enter your zip code. The resulting zone number will assist you in selecting the best grapevines for your region. Occasionally grapevines will die in the winter, especially if you live in the northern United States or Canada. Luckily there are many cold-hardy varieties being developed each year, so experiment until you find the perfect vines for your area. You can also ask about suitable varieties at your county Extension Office. Once you've determined your zone, you can start the fun part of planting grapevines, which is selecting the varieties you'd like to plant. What you plan to do with your grapes determines which variety to plant. Concord: These familiar blue grapes are probably the most versatile vines you can grow in zones 5 through 8. They can be used for liqueur, jelly or wines and come in two varieties: seeded and seedless. 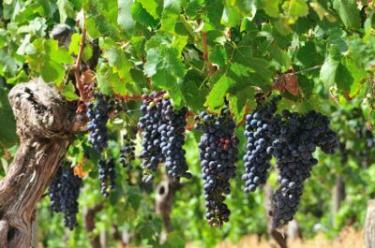 Frontenac: This variety is a great winter-hardy grape that can be grown in zones 3 through 7, and it is used primarily for wine making. Golden Muscat: Choose this variety for vines that produce large clusters of golden colored grapes perfect for eating. These are ideal for gardens in zones 5 through 8. Marquis Seedless: The Marquis is the perfect green seedless grape that goes with everything from raisins to wine. This seedless variety does best in zones 5 through 8. 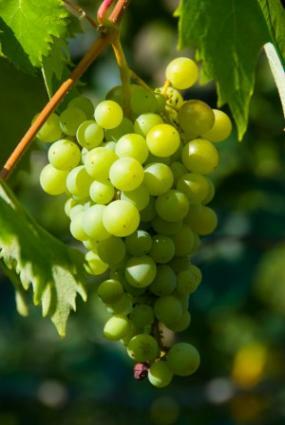 Chardonel: These amber grapes are perfect for winemaking and grow best in zones 5 through 8. Where you choose to plant your vines will make all the difference in whether they grow beautifully or simply die in the ground. The following guidelines will help you plant your grapes successfully on your property. When deciding where to plant your vines, choose an area that has plenty of sunlight for at least half of the day and a place where you can train the vines. You can choose to train them along an existing fence line or on a trellis, or you may build an arboretum that they can climb as they grow. 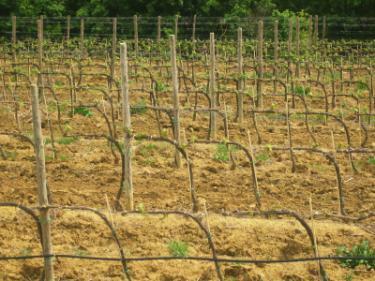 The ground where you plan to plant your grapes must be aerated and in an area where water never accumulates. Grapes hate to have their feet wet, so be sure proper drainage exists where you plan to grow them. If you plant them where there is too much water, even for part of the growing season, they will eventually succumb to root rot and die. Break up the soil well; it should be free of large clumps. Add a little sand and peat moss if you have a lot of clay in your soil. The pH for the soil should be between 6 and 7. Planting grapevines is a lot like planting tree seedlings. You must prepare a hole that is large enough for the existing root growth on the vine. For some two or three year old seedlings, this may mean digging a hole that is a foot or more wide. Carefully turn the earth and create a comfortable place for the roots to stretch out. Don't crowd the roots or try to cram them into the hole you have dug. Carefully place the grapevine in the hole you have dug. You may need to replace some of the dirt you have dug and mound it up underneath the center of the vine for good support. Cover the vine roots with at least an inch or two of dirt. No roots should be sticking up out of the earth. After you have planted your grapevines, water them generously, but don't drown them. If you live in a particularly dry climate, watering them every day until they are established is essential. If young vines are allowed to dry out completely, they probably won't make it until the next growing season. Water them in the early morning or late in the evening for the most lasting effect. Watering during the heat of the day isn't effective because much of the water is lost to evaporation. Water on the leaves can also cause the leaves to get sunburned. Growing grapevines is a fun and fascinating hobby. If you choose plants that are hardy in your zone and you plant them in well drained areas, you are likely to find success with this versatile landscaping plant. However, if at first you don't succeed, don't be afraid to try again. No matter how you prepare your grape crop, the end result is sure to be delicious.